The National Home Builders Registration Council (NHBRC) was established in 1998 as a regulatory body for the home building industry. Their mandate is to protect house-building consumers and to make sure that building industry standards and regulations are followed. Their stated aim is to protect housing consumers who use contractors who deliver housing units of substandard design, do bad work and/or use poor quality building materials. There is no limit set on the value or size house that falls under the NHBRC’s mandate to protect. Legally the term “housing consumers” refers to any person who undertakes to be an owner-builder or “home builder” and/or contracts a construction company or competent person to build their house. In terms of The Housing Consumers Protection Measurers Act, any person in the business of building homes is required by law to register with the NHBRC. With this in mind, the NHBRC urges property owners to make sure that the builders they use are registered and certified by the NHBRC. All builders are certified by the NHBRC who make sure that they meet regulated industry criteria for technical, construction and financial capabilities. The NHBRC also states that if you enroll your building project with them (even if you are owner building and not using a registered builder) that they will ensure that you are protected against bad workmanship and poor building practices. They have quality building inspections to ensure that your home is not exposed to structural failure. Note that all registered builders are bound to enroll ALL their building projects. If you want to owner build, you need to apply to the NHBRC for an exemption. This means you don’t have to enrol your house, but you won’t be covered by their warranty scheme, and you won’t be allowed to sell your property for at least five years. If you don’t get an exemption and go ahead and build, the NHBRC can fine you … even though you have approved plans from you local authority. 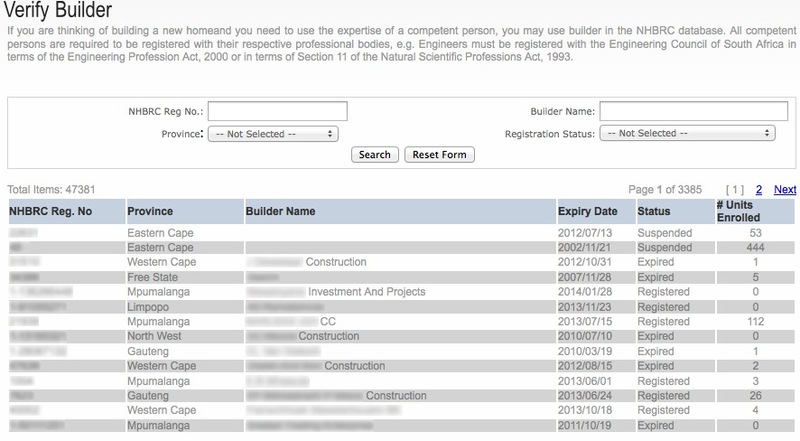 The Council has a builders database and this can be searched to see if a builder is registered and the results will show where they are located as well as their status, see the screenshot below. NB In this sample we have obscured the registration number and names deliberately. • It is vital for all home builders in the business of home construction to register with the NHBRC and to renew this membership annually. 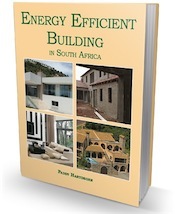 • It is essential for all home builders to enter into written agreements with clients before construction commences. • Enrolment of all homes must be done at least 15 days prior to construction beginning. • Roof leaks attributable to workmanship, design or materials as notified by the housing consumer, that occurs within a period of 12 months from date of occupation, must be rectified. • Major structural defects as notified by the housing consumer, that manifests within a period of five years from date of occupation, must be rectified. The NHBRC have a number of forms that have to be filled in from time to time. On purchasing the property I require a bond and the bank is asking for the NHBRC registration certificate. What does one do now? Great site – full of common sense / useful information. However I cant track down where the overall maximum height of a residential building is noted. I have tracked down the recommended FFL to u/s Ceiling which makes sense at 2.40m however floor thicknesses (slabs, etc) as well as use of flat roofs (with a parapet) – no where to be found on this site…. Maximum heights can be found in the local authority zoning documents. Slabs and foundations go hand-in-hand and will be specified on plans. Flat concrete roofs (with parapet walls) are mentioned in Part L but this doesn’t cover structural design. Please remember that we have not replicated the building regulations but have rather provided guidelines to them in a fairly simple way that most non-professionals (as in construction) will understand. Deirdre if you have problems with NHBRC forms it would be best to contact them for clarification. I purchased a home in april 2014 that was built in 2012. The buildings roof is collapsing due to under or no design. How do I find out who the builder was or bring this matter to the attention of your council? We are not the NHBRC – you need to contact them directly. However you should be able to get details of builder etc from your local council as they hold the approved plans. Do you allow somebody with no building experience to write your exams. the intention is to become a contractor. Please contact the NHBRC directly. Hi Malusi, We do not do enrolments. The NHBRC does not require you to enrol for additions. Send through a copy of builder and client standard agreement form. to register with NHBCR when the contractor is building a house for me.